Chasing the man who broke her heart halfway around the world to tell him she's pregnant is the hardest thing Brooke Davis has ever had to do. But when she catches up with him, he's got a surprise for her, too: he's been hiding his royal roots. Nic Alessandro is a prince, and Brooke's an unsuitable match—but their attraction is hotter than ever! Although this book is part of a series - all about the Sherdana royals, oo-la-la! - I read it as a standalone and wasn't left feeling as though I was missing the entire backstory. I enjoyed Schield's writing, and the story between Brooke and Nic. Their romance felt like a real, believable connection and not one of the insta-love kind I find in a lot of romance novels. My one major complaint in the story was Nic's need to repeat the name of his former project, the Griffin, every other page. It got redundant, and irksome. 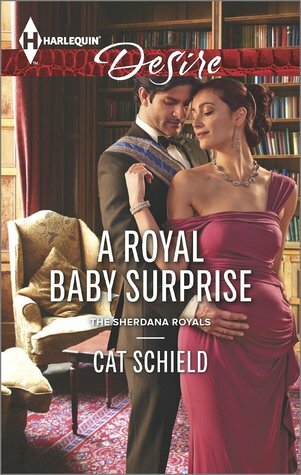 More of a novella in length, A Royal Baby Surprise was a fun, quick read with a well crafted HEA that makes me want to find a copy of the first book in the series and find out what I've missed.